A lot has changed in western Wyandotte County in the last four decades, but not when it comes to championship golf. 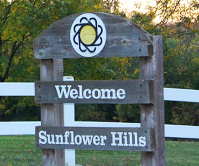 Sunflower Hills, opened 1977, has been a mainstay during the development boom just to the east that includes the Legends shopping center, a casino, NASCAR track and stadiums the Kansas City Sporting and T-Bones. Visible from Interstate 70 just east of Highway 7, Sunflower Hills is carved into rolling, wooded landscape that stretches over 7,000 yards from the back tees. You won’t find houses on Sunflower, one of its appeals, just a very engaging 18 holes of golf. “The things we hear most about the course is how challenging it is and that it is so well-maintained,” said Jeff Johnson, manager and PGA master pro at Sunflower. Surely, nobody knows Sunflower better than Johnson. He has been at the course for 37 years, or all but the first four years of its existence. He has a contract with Wyandotte County, to manage the club operations. The county owns the course and hires the maintenance staff. Johnson grew up in Kansas City, graduating from Washington High School in KCK. He no longer plays in tournaments but has regular Sunday rounds with friends and keeps busy giving lessons to players at the course. The course layout has not changed much in its 41 years. In 2003, zoysia fairways came to Sunflower, along with new cart paths and watering system. The only changes in recent years have been the removal of some diseased trees, Johnson said. Two years ago, the course hired Jonathan Bennett, formerly at Kansas City Country Club, as superintendent. Johnson gives Bennett credit for the top condition of the greens and fairways at Sunflower. The course has added some tee boxes on fairways to shorten the long course for some players. In all, it has five sets of tees. Designed by Roger Packard, the course features large but often elevated greens that require smart approach shots, preferably leaving the ball below the hole. The course has six dogleg holes. Trees are a factor, especially on holes 6, 9, 10 and 11. “Hole six is where the course starts turning a little difficult,” Johnson said. Water becomes a real factor on holes 13, 14, 17 and 18. “Those four holes in particular really challenge the players as far as forced carries over water,” Johnson said. Sunflower is 7,032 yards off the back tees. The other sets are 6,659 6,030, 5,838 and 5,107 yards. Slope and course ratings are relatively high. While hilly, the best landing areas can be seen from the tee box. Drivers can be used off the par 4 and par 5 holes for most players. Players at Sunflower typically come from surrounding neighborhoods as well as the Shawnee and Lenexa areas of Johnson County, Johnson said. A lot of players come down from Leavenworth and quite a bit of play is generated from hotels near the Legends, he said. Green fees have not changed much in the past six or seven years, Johnson said. The course is one of the most popular venues for leagues, especially seniors. Sunflower has patron card and other discounts and can host group outings, tournament and special events. 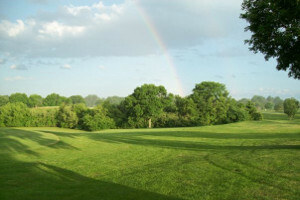 Information on all of course offerings are on it course website, www.sunflowerhillsgolfcourse.com. Sunflower has a cozy clubhouse for drinks and food after golf, and large deck overlooking the ninth hole. The course has a fully stocked pro shop and offers club repair, grip replacement and other services. Sunflower has a six-hole par 3 course for kids and beginners. Players check in at the Sunflower clubhouse. The small course is a very short drive away. The Sunflower phone number is 913-573-8570. The address of the course is 12200 Riverview Avenue, Bonner Springs, KS 66012.